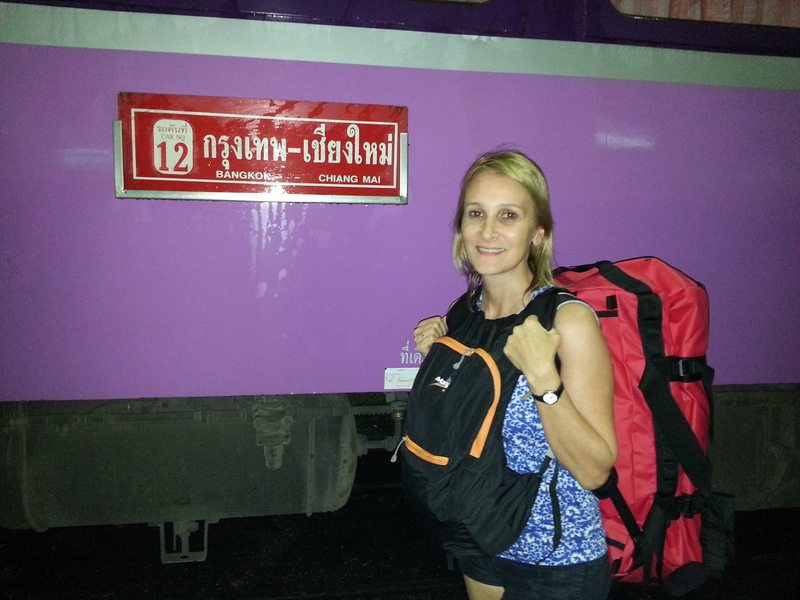 As we waited for our sleeper train to Chiang Mai, at Bangkok Station, we felt for the first time like we were real backpackers! 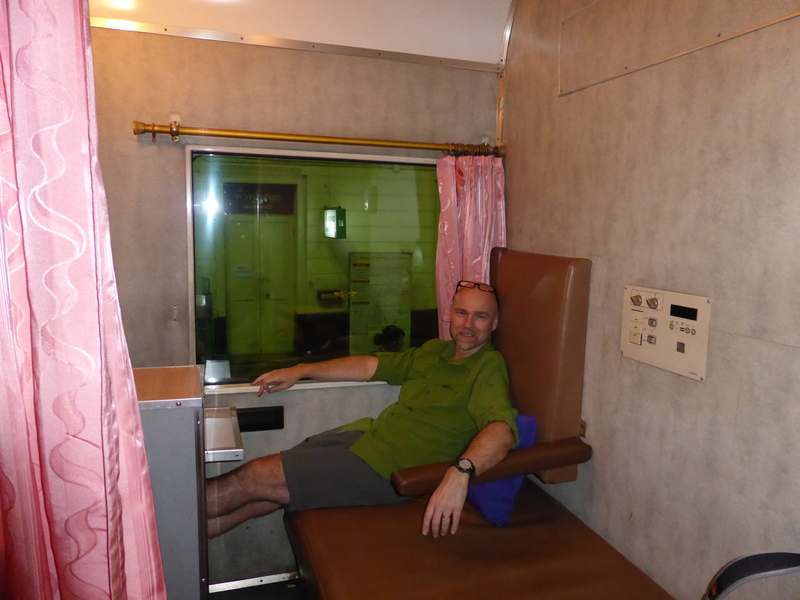 We heard that train travel in Thailand is easy, comfortable, inexpensive, and is the best way to see some of the Thai countryside. We booked a first class ticket. There are various combinations that can be made with shared cabins etc, but we decided to go for the single berth compartment, that although more expensive (about 1, 953 Baht, £40 per person, per compartment ), we felt that would give us more privacy and also a better sleep. We had a room next door to each other with a connecting door (which we kept open), although we spent all our waking time hanging out together, in Brian’s cabin. The seat turns into a bed (a steward comes and makes the bed for you later on), each room has a sink, mirror, little table and a very large window to see the countryside go by. We also found that with a press of a button, the head of our bed would go up and down to a better position for you to see the pretty scenery going by. Even in the dark, it was great to see the shadows of the trees and occasional lights as we passed through towns and villages along the way. The toilet was at the end of the corridor from us (thankfully, since it did stink of ammonia so badly I nearly gagged every time I had to use it. It did get a little better when the train was moving since some fresh air started getting through it). I was also glad that it was not a squatting toilet . Our train waiter (or shall I say” waitress? ), was a lovely (ladyboy) called Sammy, very sweet and friendly. 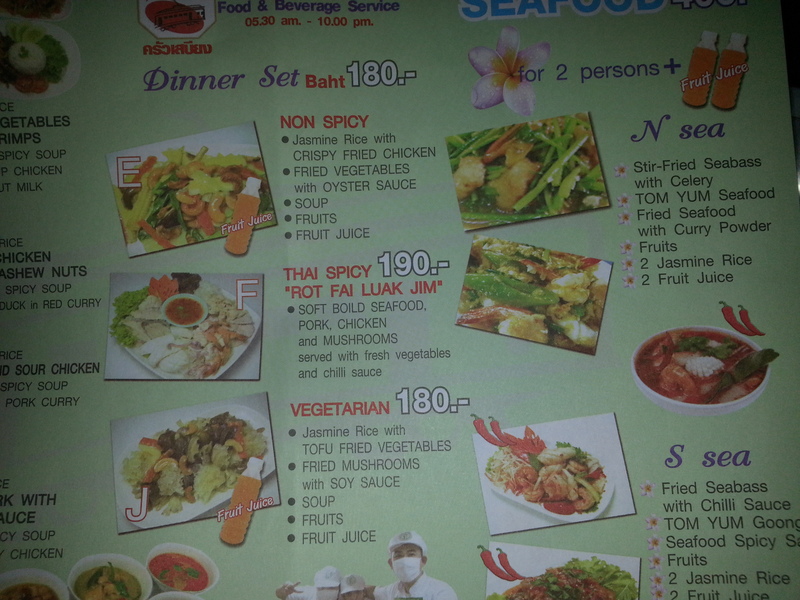 She gave us the menu, to choose dinner for tonight and breakfast for tomorrow morning. We were so excited when the train started moving (finally, after a little delay of about 30 minutes) and we could see first all the streets, houses, buildings and lights of Bangkok passing by our big window and then later it was all dark with the occasional lights from a small town that we crossed on our way to Chiang Mai. We ate our dinner (the food was ok, but not great) had a drink and chatted until bed time. We fell asleep with the gentle rocking of the train, in fact I manage to sleep very well and woke up feeling refreshed. We were up as soon as the sun started rising, since we wanted to see as much of the countryside as we could. (When I say up, I mean pressing the button to raise the seat up and watch the countryside go by!) It looked lush, farms, rice paddy fields, animals, children waving at us as we went passing, the train climbed higher and higher going up the hills and we could also see bridges and rivers and lush green jungle. It was beautiful. It felt like an Adventure. We arrived in Chiang Mai at about 1 pm, and headed to our hotel (Ching Mai Night Bazaar Boutique Hotel) in a tuk tuk. We dropped our things at the hotel and went for a walk around our local area, found a lovely little coffee shop, and ordered two strawberry and banana smoothies. 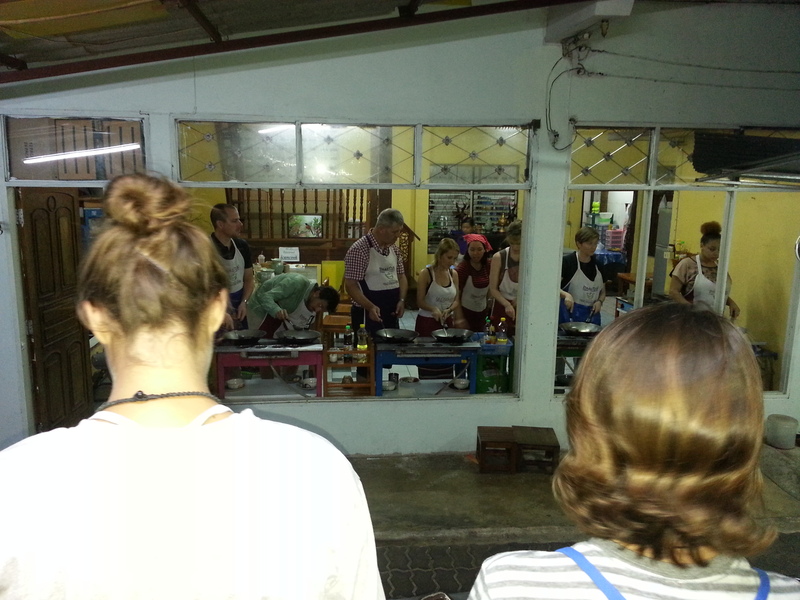 We did not stay too long though, since we were going to be picked up at our hotel at 4 pm for our Thai cooking class at the BaanThai Cookery School. At our cooking school we were divided into groups (there were 3 groups altogether), in our group we had 8 people (including me and Brian, a Scottish couple from Edinburgh, a French couple from Paris doing a 10 months RTW trip, and 2 girls from California ) all lovely and interesting people. We got a chance to chat lots with them, since after every course we would join all at the table to eat the fruits of our labours. 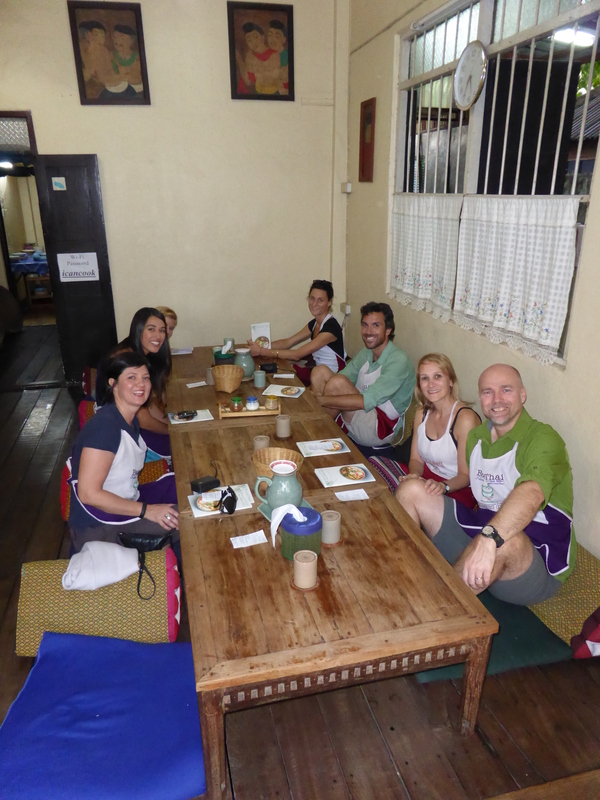 We had a choice of starters and main courses to cook, we each cooked 5 dishes. 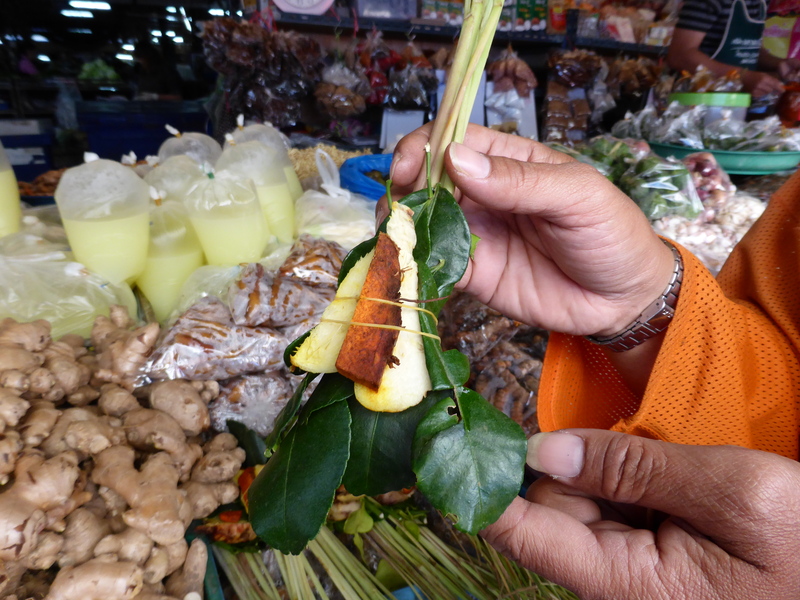 Before we started cooking we visited the food market with our teacher and he explained all about all the different spices, fruit and vegetables etc., used in Thai cooking recipes. It was fascinating. 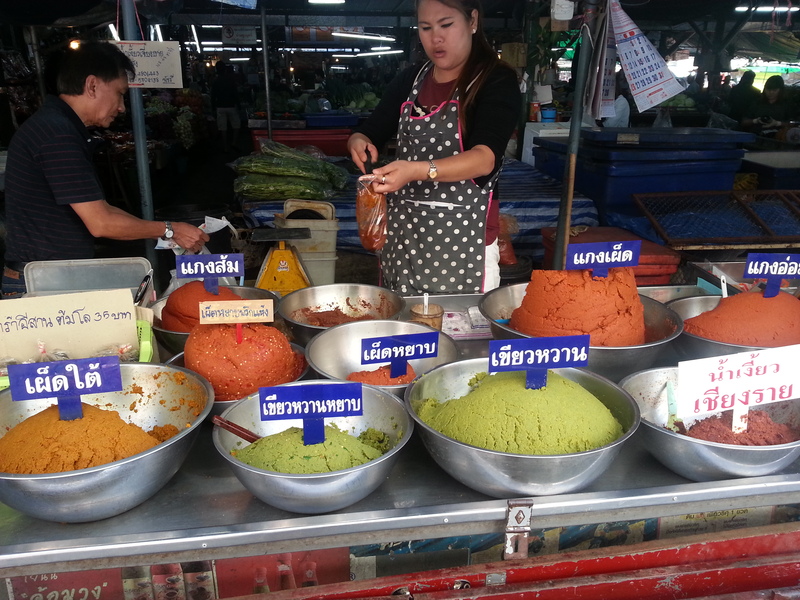 The markets were amazing, the sights and sounds and delicious smells, and lovely friendly stallholders. For starters I cooked a stir fry with chicken, egg and yellow tofu and Brian cooked Chicken and Cashew nuts. (Which he now cooks all the time at home!) 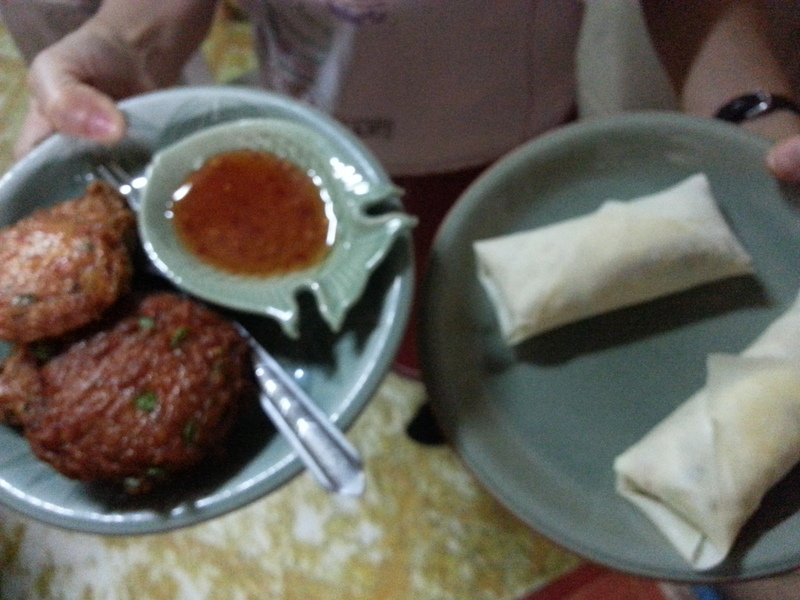 We also did a noodle soup, fish cakes (Brian), spring rolls (me), red curry (me), etc. The teachers were great, the class was about 4 hours and we thoroughly enjoyed it. We had a very full belly after our Thai feast and so afterwards we said our good byes to our dinning companions and, turning down the offer of a ride back to our hotel we walked back to our hotel feeling so fat we could burst. For the next day we had booked a bicycle tour with Araiwah- Bicycling. Mr. Nooh, our tour guide come to collect us from our hotel at 8 am, and we were ready for him. 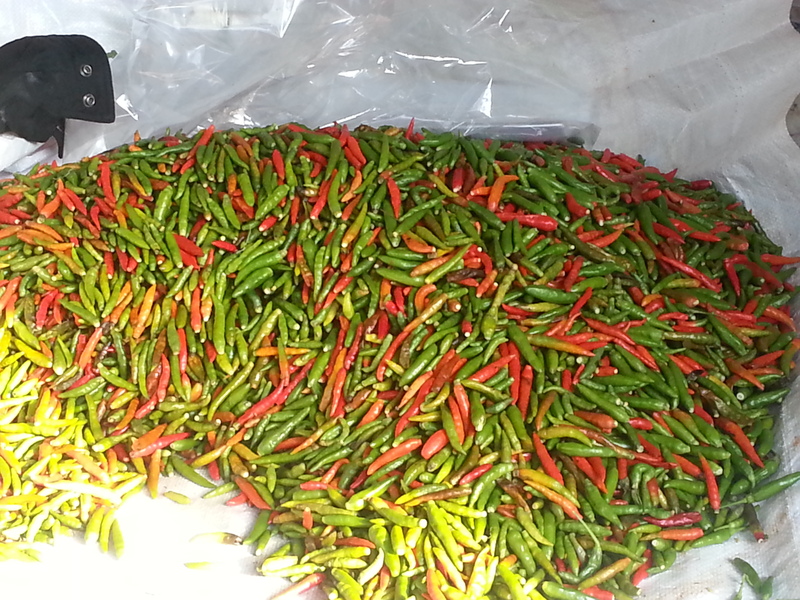 We started the tour at a large wholesale food market, not another tourist in sight and such an amazing place. 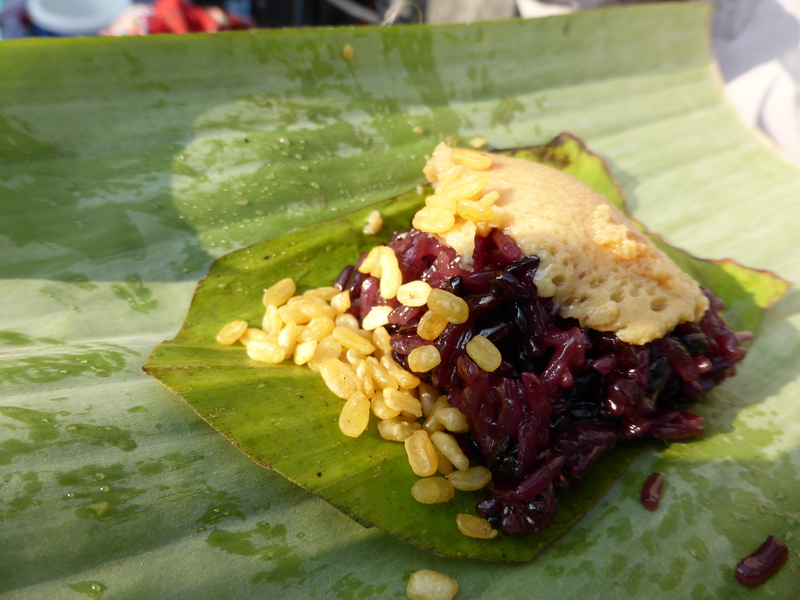 Mr. Nooh constantly bought us things to taste and explained all about all different types of Thai snacks – including the sticky rice and caramelised coconut milk served on a a banana leaf below which was out of this world! 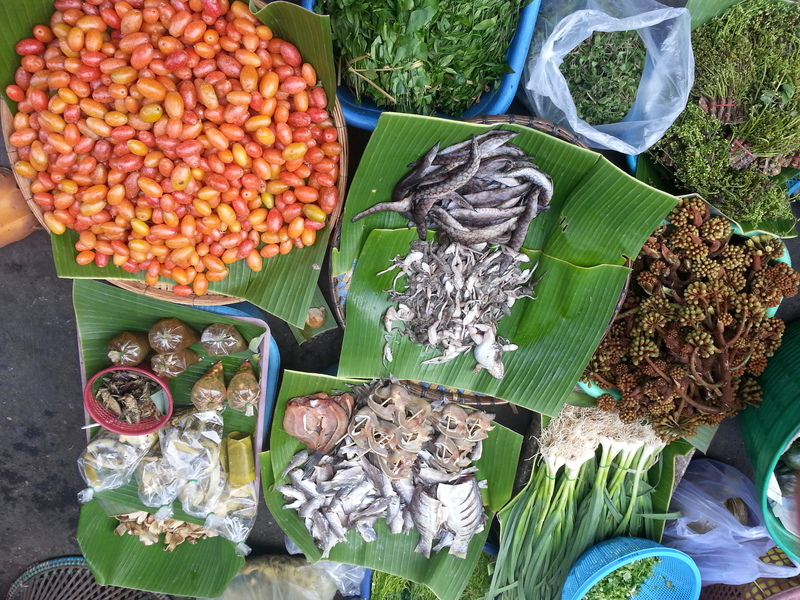 Vegetables, fruit and spices, like we have never seen before. Buckets of live frogs with nets to stop them hopping to freedom, live fish, live eels, deep fried bugs and insects. Stalls with bowls of curry pastes and spices, all looking and smelling exquisite – it was one of the highlights of the whole holiday. We were again absolutely fascinated with so much variety and flavours. We learned to say hello and thank you in Thai (taught by Mr. Nooh), which we found to be well accepted and won us few extra smiles and giggles from the locals at the market. We cycled trough residential areas, the iron bridge (see Brian and I below) over the Mae Ping river, and small roads through the old city. Mr. Nooh taught us how to navigate the madness of the local traffic, believe it or not there is a particular method to doing it, just have faith and go for it. 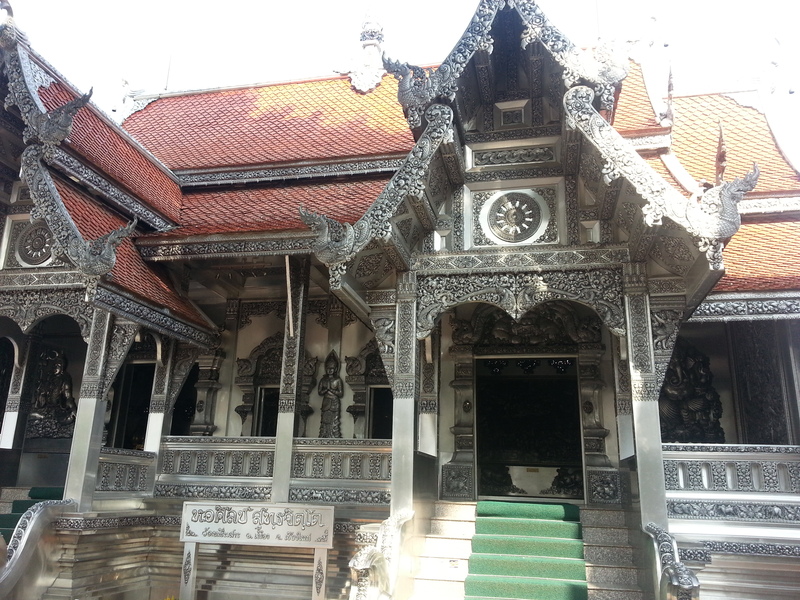 We visited some beautiful temples, including one made of aluminium, with aluminium carved Buddha’s, animals, and scenes from life in Thailand. 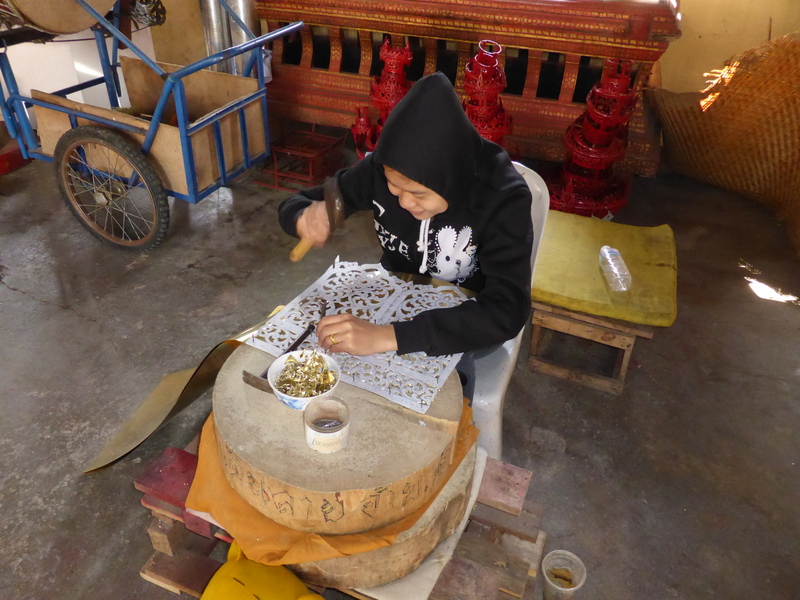 We also stopped to visit the metal workers shop inside the temple and watched them doing all the decorative and intricate work, using 18 carat gold painting. Mr. Nooh told us that some of the workers were Burmese women that would get paid very little for their work, about 300 Baht (£6 ) a day, but they were glad to at least have a job. Refugees from Myanmar (Burma) have fled across the Thai border since the 1980’s, many working in exploitative conditions, where they are not even paid a minimum wage. 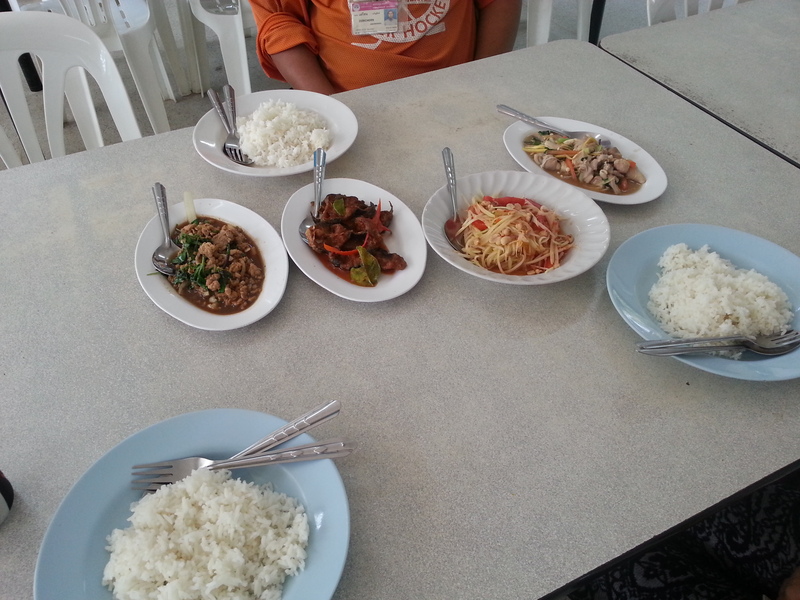 We stopped for lunch at the University canteen, where again he bought us a delicious lunch and drinks and we chatted with him about life in Chiang Mai and he told us of his dream of one day to have his own organic farm. He spoke very good English and had many interesting tales to tell, and we both thoroughly enjoyed his company. This University was established in 1964, and we visited the main campus about 2 Km west of the city centre. There are bike lanes through out the campus and lovely coffee shops to stop for a break. We stopped for coffee at one of this lovely places, which was set by the river with very picturesque and relaxing views . Well rested we then proceeded towards a waterfall. The hill up to the waterfall was the only part of the tour that we felt that it was a little bit strenuous and at places I had to get out and push the bike up hill, but Mr. Nooh rode his bike effortlessly up, showing us how it should be done. The waterfall was beautiful and so refreshing to be able to dip your toes in the cold water and just relax among the trees and rocks. 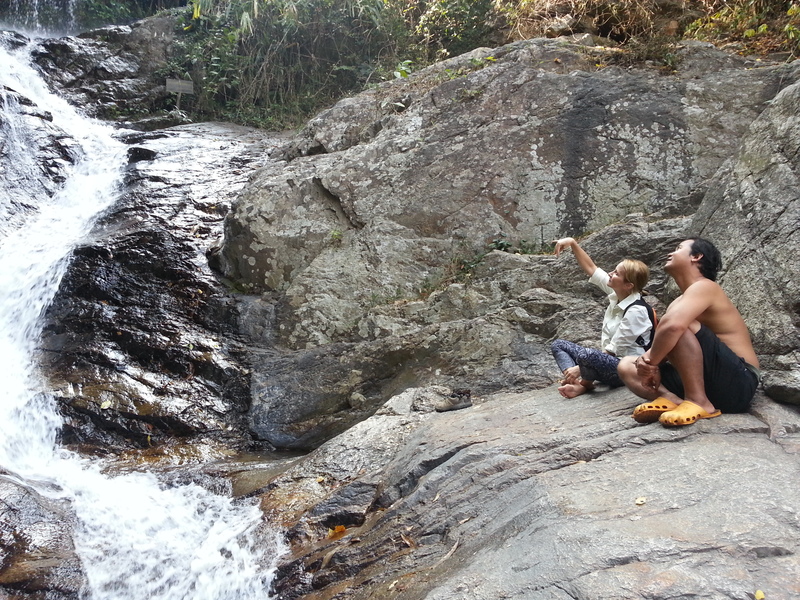 See below me having a chat with Mr. Nooh, while Brian was taking a nap on the rocks nearby. We finished the tour visiting a fabulous flower market full of amazing orchids which I adore. It was a great end to the tour, we were tired out by then and ready to get back to the hotel for a well earned rest. I would recommend this cycling tour 100%, Mr Nooh showed us a side to Chiang Mai that tourists would never see without the company of a such an informative and charming local guide. All the food, drinks and snacks are included on the price, and he also paid for our transport to and from the place where we collected the bikes. After our rest by the hotel pool (well more like a plunge pool really ), we went out to enjoy the night life. We had dinner (although it was a very disappointing dinner) in a big sea fish restaurant that had no character, awful food, very bad service and in fact the worst meal we had in our 2 weeks in Thailand, and then just walked around town taking in the sights and sounds in the warm evening air. Chiang Mai is well known for being the second largest city in Thailand, yet it has a compact centre, it is less frenetic than Bangkok, and much easier to find your way around it. The old city is bounded by old brick walls in a shape of a quadrangle. It contains hundreds of sacred temples, and we barely even scratched the surface as we lacked time to explore it fully. At night time the city came alive, we enjoyed people watching and Brian particularly enjoyed meeting these lovely ladies (!! ), who were promoting their show inside the Night Bazaar. Our hotel was very near the Night Bazaar situated on Chang Klan Road which offered a variety of handicrafts, clothes, jewellery, paintings, food stalls etc. We practised the art of haggling , which Brian has become an expert on, and bough a few small gifts for people at home. We headed back to our hotel at about 10 pm, keen to get a good sleep since the next day would be another exciting day – we had booked to visit the Elephant Farm for a 1/2 day with these amazing giants and we also wanted to visit Wat Phra That on top of Doi Suthep Hill. I love the idea of a bicycle tour. Totally agree that this is a fabulous way to see parts of a city one would never otherwise encounter. The train ride looks fabulous and I too would spend the extra money for the privacy and a good night’s sleep!